David and Sue Smith, who met as toddlers on a polio ward in Kent. They have just one regret about contracting the disease. Sue and David Smith were both just toddlers when they contracted polio in 1949. But it was this devastating disease that would bring them together. An outbreak of polio tore through their hometown of Gravesend, in Kent – part of a global epidemic that hit the UK, Canada, and the US, where it claimed more than 2,700 lives. The couple, who have now been married for 44 years, were placed in cots on the same isolation unit near Gravesend in Kent. David and Sue shared their story with Global Citizen as part of a campaign to raise awareness of polio, and help put a stop to the disease worldwide. “I don't know for sure how I contracted polio but I had been at a party and the next day everyone at the party was put in isolation. I was in hospital for six months,” said Sue, who was 15 months old when she contracted the disease, just a few years before a vaccine was developed that would eradicate it almost completely. As David and Sue recovered from their stay in hospital and grew up, they became friends despite going to different schools, and were always aware of their first meeting on the ward. But it was when they got talking at an end-of-college party that their relationship developed, and they began meeting more frequently before getting married in 1973. Up until the 1980s, polio was still paralysing people in the UK, and Sue and David are two of more than 120,000 men and women in the UK suffering from the after-effects of the devastating disease. It is fast-acting, affecting the body within hours in some cases, and produces extreme muscle weakness and paralysis, seriously affecting future growth. In some cases, it can be fatal. 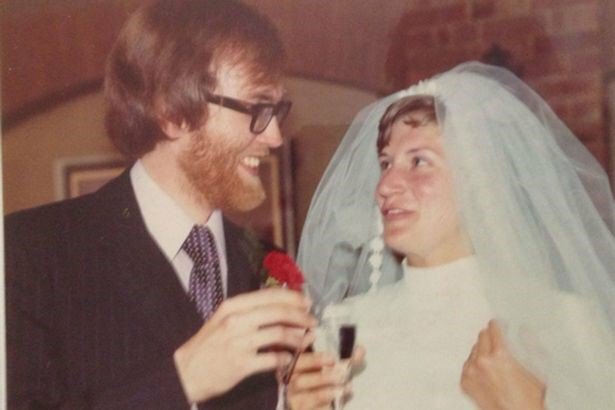 David and Sue Smith on their wedding day in 1973. David and Sue were lucky. They recovered and have been able to live full, active lives; David worked as accountant while Sue was a teacher. They also have two grown-up sons, Adam, 40, and Oliver, 38, and are now the proud grandparents of four children, aged 9, 6, 5 and 2. Despite the long-lasting effect polio has had on their mobility, they have never found it to have a negative impact on their family life. “Having polio and bringing up two children impacted the children in a good way, because they learnt to adapt,” said Sue. David, though, does have one big regret about polio’s impact on his life: he has never been able to dance with Sue. “We’re both musical. I play the guitar and Sue plays the piano. And I feel that dancing is one thing that polio has stopped us from enjoying,” he said. A doctor in Afghanistan, where polio is still endemic, assesses a child. Polio is still endemic in Pakistan, Afghanistan and Nigeria – meaning that it has always been a constant threat in those countries – but a cheap vaccine is available that could put a stop to it for good. The fight against polio is almost complete. Since the World Health Assembly passed a resolution to eradicate it in 1988, global incidence of the disease has decreased by 99.9%, and an estimated 10 million people today are walking who would otherwise have been paralysed. In August, the UK government dedicated £100 million in a final push to make the disease history, to be channelled through the World Health Organisation (WHO) to implement programmes of the Global Polio Eradication Initiative (GPEI). Samima, a volunteer polio vaccinator in Afghanistan, marks the door of a household after vaccinating children. If the campaign is successful, polio will be only the second human disease in history that has ever been eradicated – the first being small pox. Global Citizen campaigns to achieve the UN's Global Goals, which include action for global health and well-being. You can join us by taking action to combat polio here. Let's make sure we win this fight.